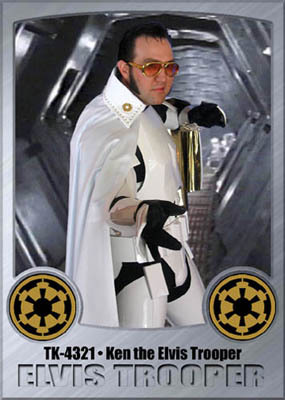 Who is the Elvis Trooper, where did he come from, is he really Elvis or a Clone, and why is he here? These are just some of the many questions that may have brought you here. Well, there are no answers to be given here, just a photographic documentation of the many Elvis Trooper sightings that are being reported across this great land of ours. If you are ever so lucky as to have your own Elvis Trooper sighting, then I suggest you get photographic proof, as most people will never believe you when you tell them about seeing him. Feel free to approach the Elvis, as he does not bite, hard, and is always willing to get his picture taken with you. And if you don’t approach him then look out, he might just approach you for a picture anyhow. And if you are lucky enough to brave having a picture taken with the Elvis Trooper, then feel free to Email us so we can see your proof, and might even post your sighting. Well, now that you know a little more, or even less, feel free to look at the picture galleries to the right. But be warned some of the pictures are of Elvis with hot women, so if you are offended by such things then best to turn back now. Or check out that mild mannered Elvis Solo, Indiana Elvis, or the other various adventures of our hero in the More Elvis section. Please note: There are various reasons why I do not wish to be sued so keep in mind this site is only for fun and I make no money off of it. Well unless anyone wants to pay me for this and put me to work pimping your product or such, in that case please feel free to Email me.